Image caption The killings have caused the president "grave concern"
At least five people have been killed in southern Malawi after they were accused of behaving like vampires. The UN says it has pulled staff out of two districts as the vampire scare sweeps across the south of the country. According to reports, the victims were killed by vigilante mobs who suspected them of drinking human blood as part of magic rituals. A night-time curfew has been imposed by the government to prevent any more deaths. The curfew restricts movement to 10 hours a day, from 07:00 until 17:00 local time . The UN said in a report that the vampirism rumours appear to have originated from Mozambique, and spread across the border to the Malawi districts of Mulanje and Phalombe. It is unclear what sparked the fears, but - according to a UN report seen by news agency Reuters - villagers had set up road blocks as they tried to hunt the "vampires" down. As a result, it had instructed all staff to temporarily relocate to a safer area. 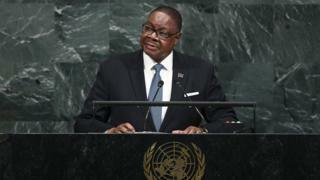 Malawian President Peter Mutharika has vowed to launch an investigation into the killings, with his office releasing an official statement saying the matter was "of grave concern" to the entire government". Education standards are low, with belief in witchcraft widespread. A spate of vigilante violence linked to vampire rumours also erupted there in 2002.